In this talk, the basic mechanism of light propagation in a triangular-lattice photonic crystal fiber (PCF) is first discussed with some key properties like, endlessly single-mode nature, controllable dispersion, high birefringence. 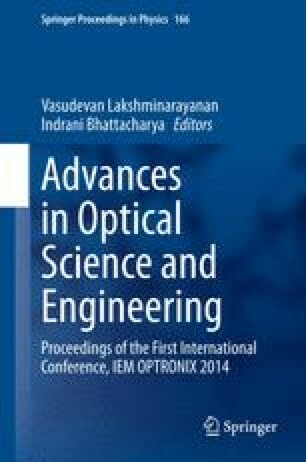 Then a systematic study of a photonics crystal fiber design as a host of fiber amplifier is performed by varying all associated parameters towards utilizing controllable effective numerical aperture and tight modal confinement. A finite difference (FD) mode calculation analysis is used to determine the modal characteristics of the structure, which is then used to solve a standard rate equation. Results show that a spectral gain of the amplifier as high as 51 dB and that too over a short length ~2.5 m of the fiber is achievable. For field-deployment of the amplifier as inline component, the splicing/coupling loss (due to fundamental mode mismatch) of this all-fiber device is calculated. Notably, the coupling loss with standard telecom-grade SMF-28 fiber is reduced through an improved mode-matching of the structure-design. These results record a marked improvement in fiber amplifier performance in terms of realizing high-gain EDFA-PCF amplifiers.